After 700 units, the 1951 model was introduced. The one important innovation was the use of VDO instruments. Of course the Saab 92 had its shortcomings. It would be strange otherwise. You had to be both agile and strong to load the baggage compartment, from the inside, the only way it could be done; it was often hard to keep engine temperature at its proper level; rearward vision was hardly adequate; it was easy to pull off the starter cable; the headlights were prone to dazzle oncoming traffic, and so on. But generally, Saab owners liked the car; it created enthusiasm by its roadholding and charmed many with its well rounded and distinct styling. It was sensible and distinguished by the designers' safety consciousness. What other car could be found with as rigid a body, or as strong windshield pillars? What other car had a flat floor pan, which not only decreased air drag but also made it possible to get through on rough and unplowed winter roads? The car was eminently suited for winding gravel roads and it hadn't been long on the market when it started appearing in tough, performance type rallies. 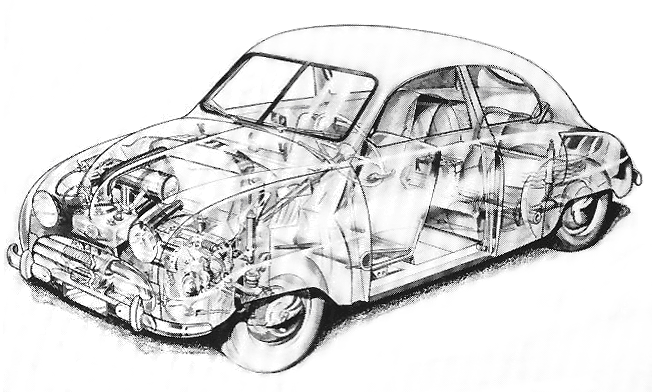 Here is the Saab 92 in an X-ray view. The drive train does not use up very much space. The two cylinder engine is transversely mounted far forward. The radiator is at the far rear of the engine compartment and placed high so that it does not interfere with the leg room for driver or front seat passenger. The car is extremely streamlined and has a strong, selfsupporting unit body with a flat floor pan. 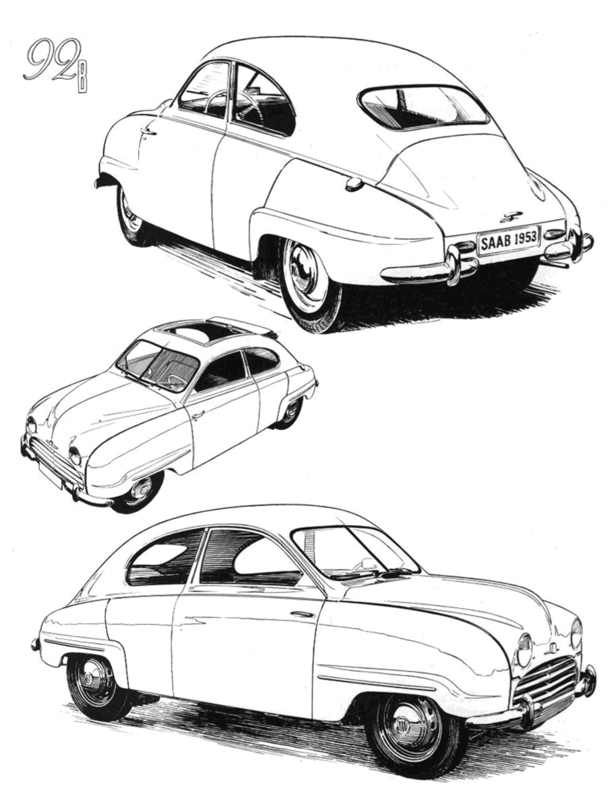 Despite the slight engine output and only three forward gears, Saab 92 was a quite sporty automobile. On slippery and winding roads it could easily show up many larger cars, a fact that the rally enthusiasts soon discovered. 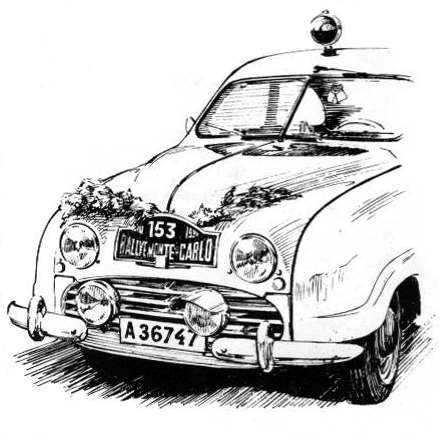 In the 1952 Monte Carlo Rally, Greta Molander won the Coupe des Dames in a 92, turned to 35 hp. Length 3.92 m. (154 in.). Width 1.62 m. (64 in.). Height 1.42 m. (56 in.). Wheelbase 2.47 m. (97 in.). Track, front and rear, 1.18 m. (46.5 in.). Ground clearance, approximately 0.17 m. (6.7 in.). Curb weight 765 kg. (1.687 lb.). Two cylinder, two-cycle engine. 764 cc. 80x76 mm. Compression 6.6:1. Maximum output, 25 hp at 3,800 rpm. Maximum torque 5.6 kpm. Solex downdraft carburetor, 32 AIC. Mechanical fuel pump. Lubrication through 4% oil in the fuel. Water cooling with thermo siphon circulation. Dry plate clutch. Three forward gears with synchro between 2nd and 3rd. Column mounted shift lever. Gear ratios: 18.5, 8.55, 5.35; reverse 24.65. Free wheeling. Front-wheel-drive. Hydraulic Lockheed four-wheel drum brakes. 593 sq. cm. friction surface. 8 inch drum diameter. Mechanical handbrake acting on rear wheels. Rack and pinion steering. Turning circle diameter 11 m. 15 inch steel disc wheels, 3.5 inch rims. Tires, 5.00x15". Four wheel independent suspension. Transverse torsion springs and hydraulic telescoping shock absorbers front and rear. 6 volt electrical system. 80-90 Ah battery. 130 W generator. Steel unit body construction with two doors. Flat floor pan. 4 seats. Fuel tank, 35 liters. Air drag coefficient, including cooling resistance, 0.35. Top speed 100-105 km/h. Aside from some detail changes and quality improvements, the Saab 92 remained virtually unaltered for the first three years, Saab was still a new and interesting car that had not yet become overly visible in Swedish traffic, so no special sales stimulating innovations were necessary. Maybe the single exterior dictated its retention. Like the shape and the construction, the color contributed to the car's uniqueness. After 5,300 cars hade been built, a few rather urgent improvements were incorporated - others had to wait yet another year. The 1953 model was introduced in December of 1952 and the changes were so many that the car got a new designation, Saab 92B. Most noticeable were the enlarged rear window and the trunk opening - now from the outside. The battery was moved to the engine compartment, the spare wheel was placed in a compartment inside the trunk and the fuel tank was moved forward, with filler opening on the left hand side. The seats now came with foam rubber padding; the front seat back rests were contoured, and the rear seat could be removed to extend the cargo space when required. And: cars now came in several colors. The next major step came with the 1954 model (from car No. 8001), when synthetic lacquer was introduced , along with a more powerful (28 hp) engine, decorative moldings at the wheels; wheels with 12 important and decorative ventilation holes; improved heating and headlights somewhat more friendly to oncoming traffic. In order to prevent icing in the new type carburetor, it now had an intake air heater. One can also note that the 92 now came equipped with grab handles, a rear ashtray, new control knobs and draft deflectors on the front windows. 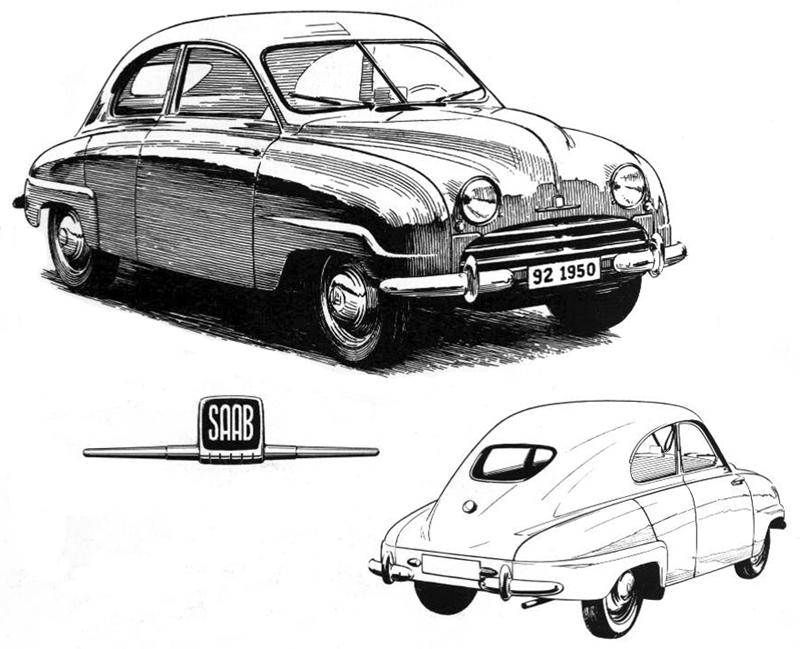 On March 6, 1954, Saab Number 10,000 rolled off the assembly line. One car was coming off the line each 27 minutes, a production pace five times that of the first year. In four years Saab had gained a foothold on the market och had become a popular make in Sweden. Additional production increases were necessary, but first more plant space was needed. Instead of adding to the Trollhattan plant, the decision was made to move engine and gearbox production to Gothenburg, where Saab hade just purchased a facility with office and production area measuring some 183,000 sq. feet (17,000 sq. meters). This brought the total car activity floor space close to 377,000 sq. feet (35,000 sq. meters), and gave the necessary boost to the next phase of the production development. The 1953 model was called 92 B and was easily recognizable by the larger rear window, the position of the fuel filler cap on the rear fender and the trunk lid that made the baggage compartment accessible from the outside. And: the color was not necessarily green. Differences between 1954 and 1955 models were minimal. The 54 model came with a 28 hp engine, moldings on the fenders and ventilation holes in the wheels. A sunroof option was also available.